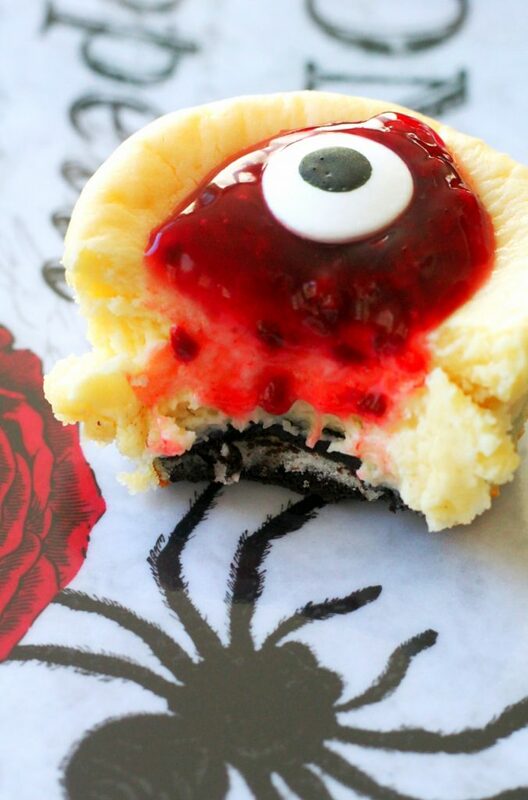 Bloody Eyeball Cheesecakes put the trick in a very delicious treat of white chocolate cheesecakes with an Oreo crust and raspberry topping. I love Halloween. I don’t love it as much as Thanksgiving and Christmas but it’s still a lot of fun. Our kids are still totally into trick-or-treating. Caleb will be dressing as his favorite football player this year, Tyler Eifert. And Hannah is going as a zombie-fied Meghan Trainor. Should be an interesting evening! So I always need to have some fun food for after trick-or-treating. 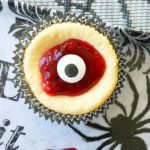 This year I decided to re-make one of my favorite mini cheesecake recipes for Halloween. White chocolate and raspberry is such a fabulous flavor combination. And in this case the raspberry sauce doubles as blood. 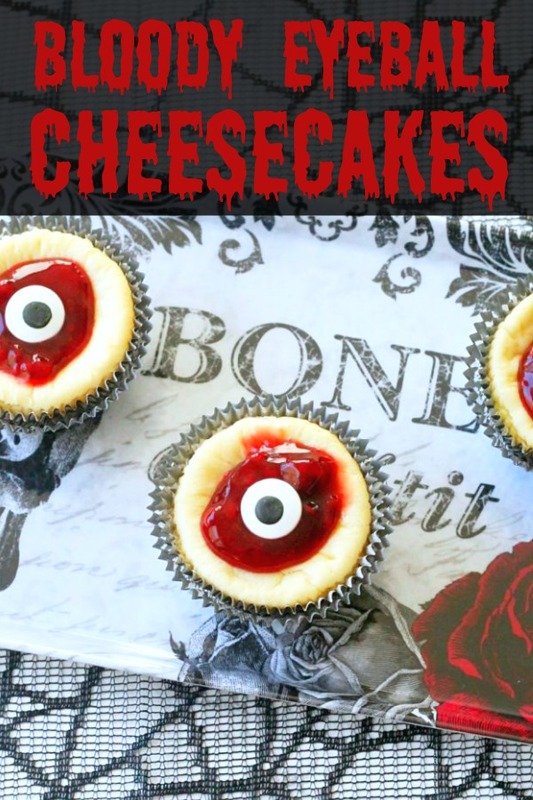 These little cheesecakes are easy to transport and eat because they are handheld. And they are simple to make because the crusts are Oreo cookies (no crushing necessary) and the filling is made of just five ingredients: cream cheese, sugar, eggs, vanilla and melted white chocolate. 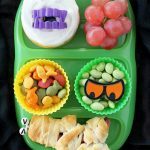 They can be made the day before so they are terrific for your after trick-or-treating parties. And they are just the perfect amount of spooky don’t you think? They still come off as a fancy little dessert but they are SO festive! And most importantly they just taste so good. Chocolate, white chocolate and raspberry in a mini cheesecake. 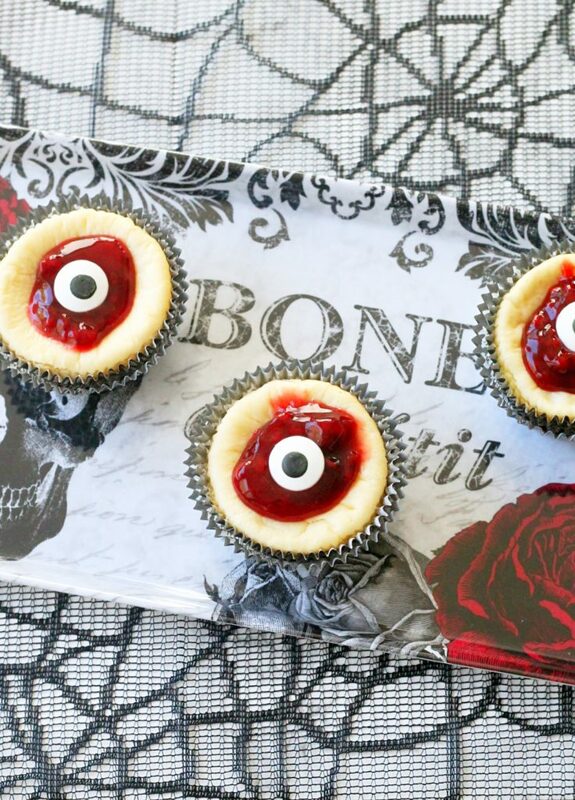 You’ll be craving these well past Halloween. Line cupcake tins with 15 liners. Place one OREO cookie in the bottom of each liner. Place the cream cheese and sugar in a large bowl. Use a hand mixer to beat the cream cheese and sugar together until fluffy. Add the eggs, vanilla and melted white chocolate. Beat again until well combined. Use a large scoop to place about 1/4 cup of cheesecake batter into each cupcake liner. Bake 17 - 20 minutes, or until cheescakes are puffed up and still have a little "jiggle" in the center, rotating the pans halfway through baking time. Allow the cheesecakes to chill in the refrigerator overnight. 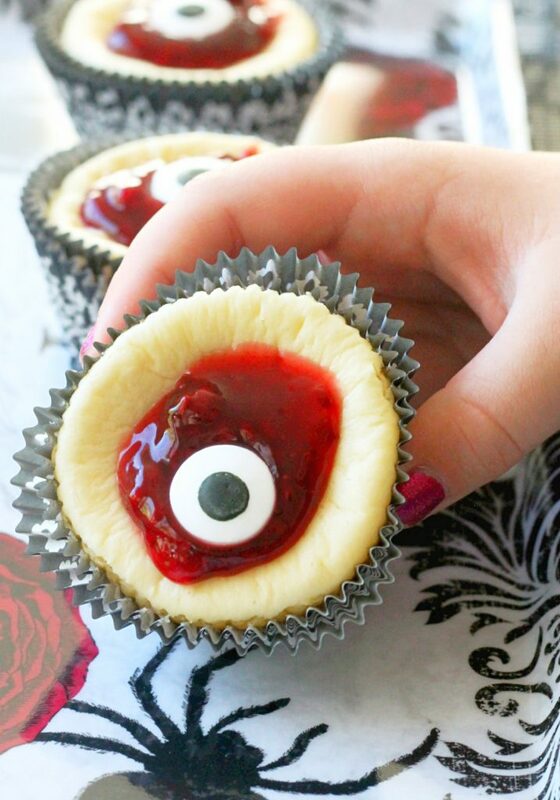 When ready to serve, top each cheesecake with raspberry sauce (blood) and a candy eye. Wow! So perfect for halloween. Love how easy they come together with just a handful of ingredients. These are so cute!!! I love the flavor combo of white chocolate, oreo, and raspberry. And your daughter’s costume choice cracks me up! She’s a funny one for sure 🙂 Thank you! I’m not a huge halloween person but these look so cool! Thank you Giselle. You can leave the eyes off and have a delicious dessert for any occasion! Love how festive these are! I too love Halloween and imagine I’ll love it even more once I have kids! 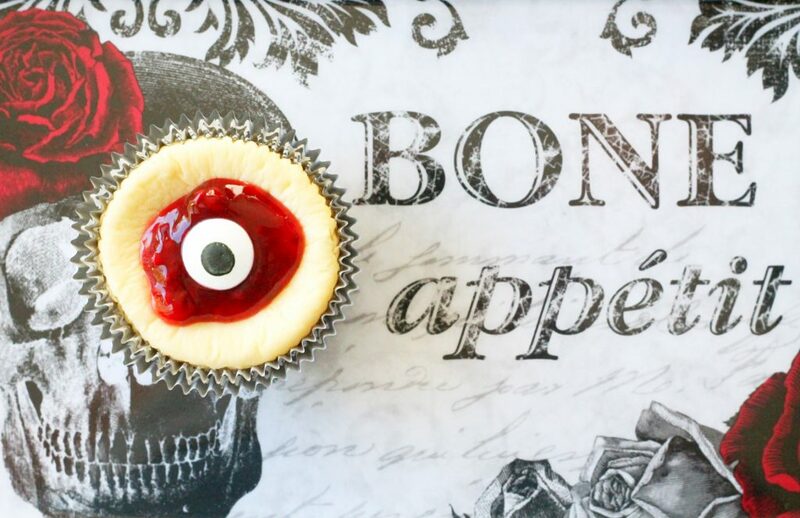 Not just scary and fun for Halloween but also delicious; essentially a trifecta! Great job with these!!! You are so creative, Jill! 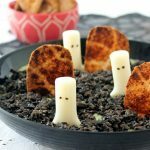 We love cheesecake in our house, so I’m adding this to my Halloween menu!